Philips’ halogen reflector lamps offer the ideal no-fuss solution for a wide variety of medical, projection and scientific illumination systems. Their proven reliability makes them ideal for retrofit installations. The burners are precisely aligned for optimal light performance. Dichroic reflectors ensure heat dissipation towards the back of the optical system, which helps the optical system remain within temperature limits. A special blue-filter version blocking out unwanted light above 700 nm is available for dental curing applications. In addition, you get all the proven advantages of halogen technology such as a CRI of 100 – the same as natural sunlight for the best possible color rendering. 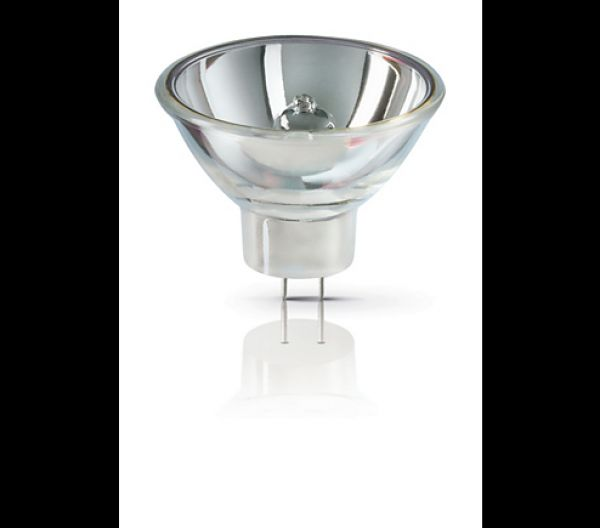 Halogen lamps also create a comfortable warm white light, and they maintain their high lumen output with almost no lumen reduction throughout their lifetime.